In the eighth pAsuram, emperumAn asks “When you have not put in any effort and say ‘I cannot bear’, would you get the result?” and AzhwAr responds “Didn’t brahmA et al who are with limited ability, get their desires fulfilled by citing their Akinchanyam (lack of anything in them)? So, kindly come and eliminate my sorrow”. sElEy kaNNAr palar sUzha virumbum thiruvEngadaththAnE! thiruvEngadaththAnE – Oh one who is residing in thirumalA! vArAy – you should come! rudhra who is omniscient, being able to see subtle things and hence became the important one in the universe and is having throat that is fully having black colour, four-headed brahmA who is the father of such rudhra, and having complete knowledge to create etc and indhra who has the wealth of three worlds say [to emperumAn] “Even without pursuing any means to see your divine feet, I am unable to bear”; Oh one who is residing in thirumalA and who is offered such prayers and surrendered with desire by such dhEvas along with their women folk such as umA (pArvathi), sarasvathI, Sachi et al who have fish like eyes, in their proximity! Just as you came [as krishNa] with dark complexion, mesmerising everyone with the qualities and activities, you should come towards me who is exclusively devoted to you and cannot sustain without you! nOlAdhu … – They (dhEvas) all individually say “I have not pursued any means to see your divine feet, yet I cannot bear without you”. When they [Siva and others] lose in a battle like the one [of krishNa] with bANa, without any other refuge, they say like this. [Why do they behave in this contradictory manner?] When rajas (passion) and thamas (ignorance) are on the rise, they would consider as in SrI bhagavath gIthA 16.14 “ISvarOham” (I am the lord); when they are defeated, they would praise him as in SrIvishNu purANam 5.33.41 “krishNa krishNa mahAbAhO jAnEthvAm purushOththamam” (krishNa! krishNa! Oh mighty armed! 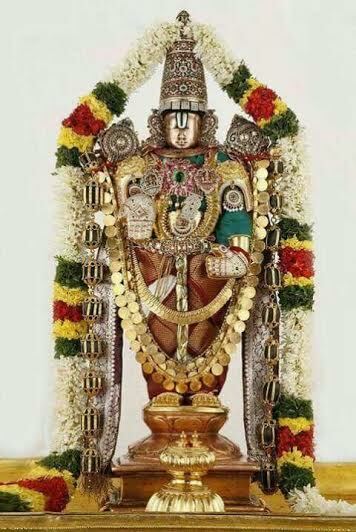 I know you as the best among the men); SrIvishNu purANam 1.9.65 “SaraNam thvAm anuprApthAs samasthA dhEvathA gaNAm” (Oh lord! all the dhEvas who were defeated by the army of asuras are surrendering unto you with folded hands). rudhra who considers himself as the primary entity in the universe due to his power of holding the poison in his throat, the four-headed brahmA who is the father of rudhra and who has even greater knowledge and powers than rudhra, indhra who is the controller of the three worlds; [AzhwAr is following the pattern of vEdhAntham] nArAyaNa sUktham “sa brahmA sa Sivas sEndhra:” (he is brahmA, he is Siva, he is indhra). When asked though they are like this, we considered their words in ahirbudhnya samhithA as authentic instructions, it is because they spoke those words when their sathva guNam (goodness) was on the rise. Just because their words are accepted, it does not mean that they are to be pursued; bhattar used to explain mercifully “It is said by periyAzhwAr ‘kAkkai vAyilum katturai koLvAr‘ (one would even hear from a crow)”. An AzhwAr [thirumazhisai AzhwAr] said in nAnmugan thiruvandhAdhi 84 “pidhrumanam ilEn” – I do not have a confused mind; “pinjagan thannOdu edhirvan” – I am comparable to rudhra in his knowledge; “avan enakku nErAn” – yet he is not a match for me [in my exclusive servitude to emperumAn]; why is that? “adhirum …” – for me who has placed my heart only in matters related to bhagavAn, would rudhra who has his interest in various matters, be comparable? [Next, brahmA’s Akinchanyam is highlighted] nAnmugan thiruvandhAdhi 9 “kuRai koNdu” – having lack of anything in him, as the tool; “nAnmugan kuNdigai nIr peydhu” – without brahmA’s intention, emperumAn‘s divine feet reached there; he did not have any tool to worship them. [Hence] dharma dhEvathA became the water in his pot; with that, “maRai koNda mandhiraththAl vAzhththi” – praised emperumAn with the portions of vEdhAntham [such as purusha sUktham] which sing the glories of bhagavAn; “kaRai koNda kaNdaththAn senni mEl ERak kazhuvinAn” – brahmA let that water flow on to the head of Siva, just like a father would sprinkle SrIpAdha thIrtham (sacred water) on his disobedient children [to purify them]. nun uNarvil – When sathvam is on the rise, they would only praise emperumAn. It is said in SrI bhagavath gIthA 14.17 “sathvAth sanjAyathE gyAnam” (sathva guNam leads to knowledge). neelAr kaNdaththu ammAnum – rudhra who considers himself the lord due to holding the poison in his throat. niRai nAnmuganum – brahmA who is the father of such rudhra and who is complete in knowledge. indhiranum – Though he is not involved in creation or annihilation similar to brahmA and rudhra, he is still counted along with them as said in nArAyaNa sUktham “sa brahmA sa Sivas sEndhra:” (he is brahmA, he is Siva, he is indhra). sEl Ey kaNNar … – When some one has some greatness, he would not remain humble in front of women; [but] when in danger they would come along with their women folk and surrender unto him. They will take shelter of emperumAn along with their wives as seen in hari vamSam 279.15 “umA sArdham ISAna:” (rudhra along with his wife umA, with joined palms, desired to speak the glories of vishNu), SrIvishNu purANam 5.7.57 “barthru bikshA pradhIyathAm” (wife of kAliya, the snake, prayed to krishNa “spare my husband from your wrath”), samkshEpa rAmAyaNam 79 “samudhras sarithAm pathi:” (samudhrarAja, the lord of rivers appeared) and SrI rAmAyaNam kishkindhA kANdam 33.40 “kim kOpa mUlam” (thArA asked lakshmaNa “what is the cause of your anger?”). thiruvEngadaththAnE – His presence in thirumalA which is easily accessible for such persons [who are looking for a refuge]. mAlAy mayakki – mAl as per thamizh dictionary means “mayangalum kUdalum kalaviyum” (bewilderment, moment before uniting, the union); explained as AzhwAr saying “you should arrive to bewilder me”; or as saying “you should arrive in a mesmerising form to make me mad”; but these are not the correct meanings here. mAl indicates black, by which AzhwAr thinks about krishNa. Just as you appeared as krishNa and made those who were with you to become mad for you, you should come for me too once; as said in nAchchiyAr thirumozhi 14.3 “mAlAy piRandha nambiyai, mAlE seyyum maNALanai” (the complete one who was born as krishNa, who caused madness in others). This entry was posted in thiruvAimozhi, thiruvAimozhi 6th centum on June 22, 2018 by Sarathy Thothathri.